Special to the DailyIn addition to gigs on NBC's Last Comic Standing, Comedy Central's Premium Blend and numerous other comedy showcases, Phil Palisoul appeared on the Tonight Show with Jay Leno. 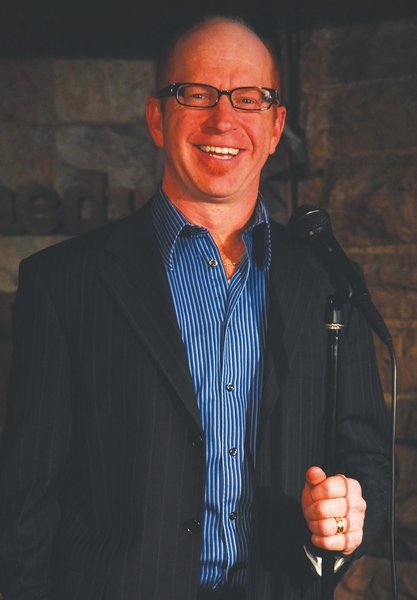 EAGLE – Funny guy Phil Palisoul brings his unique, low-key and self-effacing style to Comedy Night at the Bowlmor at The Back Bowl in Eagle on Saturday at 8 p.m. Since he first took the stage for the very first Comedy Night in 2007, he has been steadily climbing the ladder of comedic success, as evidenced by the numerous television appearances he now has under his belt. In addition to gigs on NBC’s Last Comic Standing, Comedy Central’s Premium Blend and numerous other comedy showcases, Palisoul appeared on the Tonight Show with Jay Leno. Now, with his reputation for consistent delivery and sidesplitting material established, he is opening concerts for such legendary comedians as Dennis Miller, Louis Anderson and Jerry Seinfeld. When not making his mark on the little screen, he still thrives on the live standup where it all began. From the prestigious HBO-Aspen Comedy Festival and the Las Vegas Comedy Festival to some of the best known clubs in the country such as the iconic Improv in L.A. and New York and the Comedy Works in Denver, Palisoul has found a steady stream of work that has him hopscotching the country. Opening for Palisoul is Comedy Works regular, and bettter half, Nora Lynch. Lynch returned to Denver after many years in L.A. where she was a writer and story editor for several prime time sitcoms. Her no-nonsense style has made her a favorite on stages nationwide. She is part of the club’s popular “Funny Ladies” series and is a survivor of the “Funny Final Four” team comedy competition that premiered this year. Tickets are on sale now for $12 in advance and $15 on the day of the show. There is special pricing for groups of 8 or more. Tickets can be purchased in person at The Back Bowl, or by phone with a credit card. For more information, contact The Bowlmor Lounge at the Back Bowl at 328-BOWL, or go to http://www.thebackbowl.com.